Following a design of a fellow Model T guy I made an adapter to allow the use of a standard engine stand on a T engine. The engine shown here upside down, is mounted on the side rather then on the end as usual. Here the oil pan and the transmission housing have been removed and the engine has been turned on end. 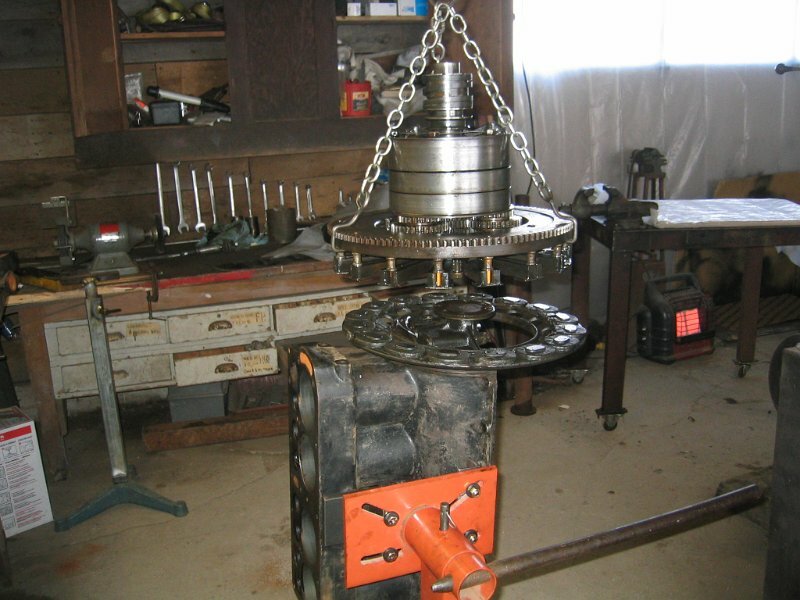 The flywheel with 16 V-shaped magneto magnets is mounted on the crankshaft flange that is only about 4" in diameter. In addition, the planetary-geared transmission, brake drum, reverse drum, the low speed drum and the clutch plates all hang on this little flange---although with the transmission cover and the oil pan installed there is a critical support bearing at the far end in the transmission housing. 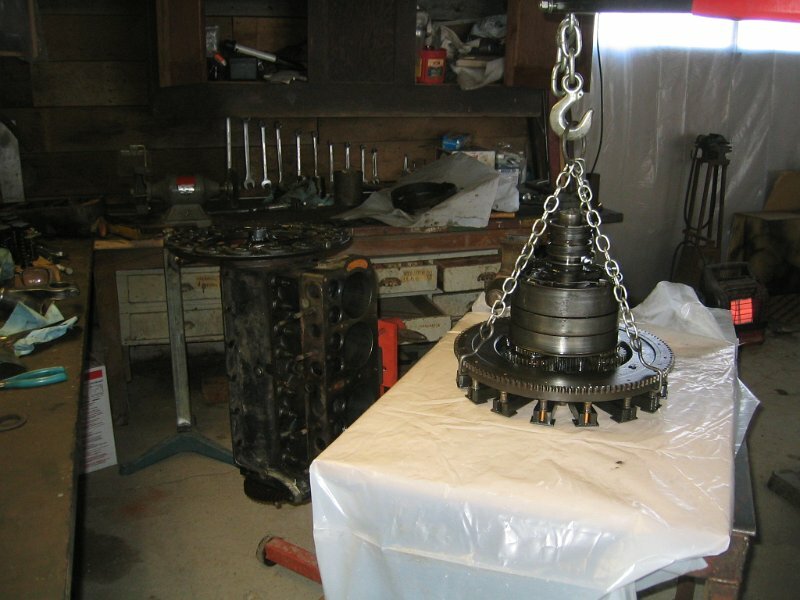 After the bolts have been removed, a borrowed special chain set is used to lift the flywheel and transmission assembly from the crankshaft flange. The magnets revolve with the flywheel and are close to the stationary coils seen in the ring below the lifted flywheel assembly. The magnets and coils generate the electric current used in the ignition system. The planetary gears can be seen just above the flywheel. The transmission and flywheel assembly is set down on a plastic covered plywood for further consideration. The clutch mechanism may need work. We will see. The three drums are the control elements of the two-speed transmission. Three foot pedals clamp down selectively on bands around these drums to provide low, reverse and brake action. The wide drum is the brake, the center drum is the low speed drum and the bottom one is the reverse drum. "High gear" is the default---no band activated. This whole assembly then rotates with the engine providing a massive flywheel effect and smooth power to the wheels. The low speed pedal pressed half way down disengages the clutch providing "neutral". The engine just back from being overhauled by Model T expert Larry Hanson is shown mounted on a engine stand borrowed from Marshall Aune, a Model A friend. The magneto coils are tested for shorts or opens using an old-fashioned, but now considered rather dangerous, method of using house current with an electric load in series with the series wound coils. The buzzing of a thin metal strap held over each coil assures they are working and that none are shorted to the mounting frame. 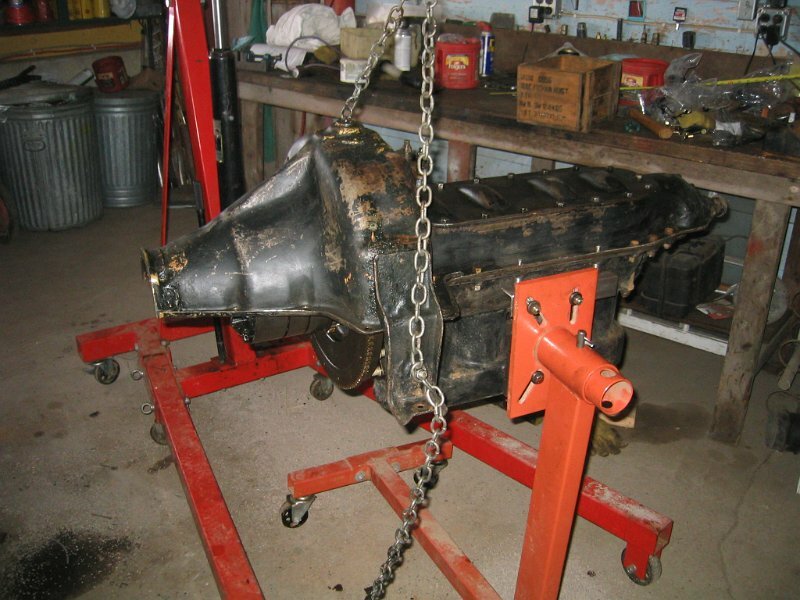 The coil frame is mounted to the engine block but must be adjusted to be at the correct distance and parallel to the plane of the crankshaft flange. Here a 3/4” square steel tube bolted the the crank flange and a digital caliper are used to measure the distance to the coils at 90 degree intervals. Selected shims are placed between the block and the coil frame, another tedious trial-and-error process that eventually gets it put right. 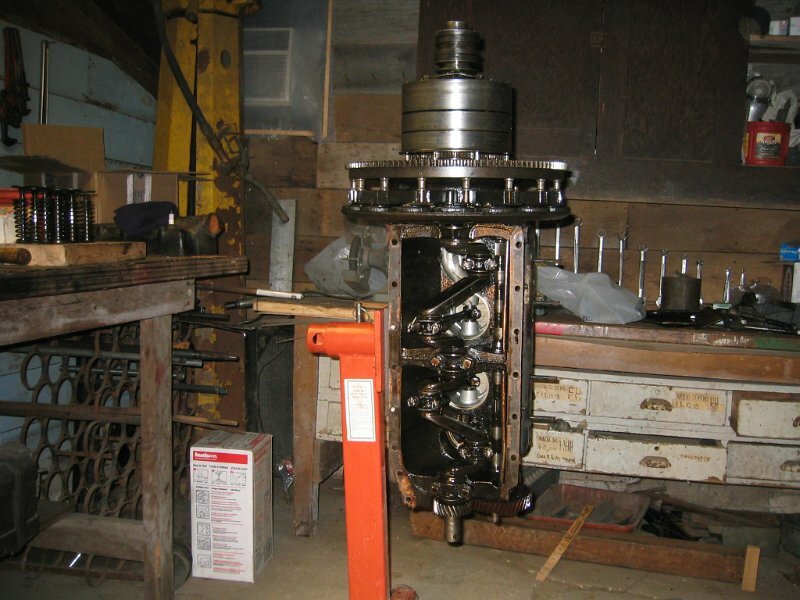 Here the transmission and flywheel are lowered onto the crankshaft flange. Four studs attaching the assembly to the flange are secured with a safety wire from stud to stud through holes in the stud heads. An oddity I read on a Model T forum was that a mechanic reported opening an engine and found that a previous Model T mechanic had “secured” them with cotter keys though the heads. The oil pan and transmission cover are installed. 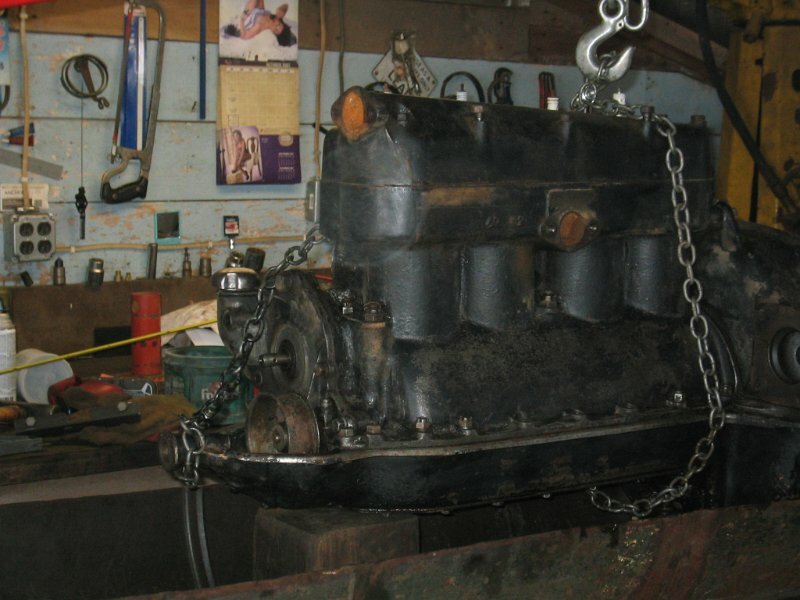 The chain hoist helps balance the now offset load on the engine stand. Extra support blocking was then set up on the frame of the stand. The separating spring and operating shaft for the reverse band are in place. Nylon cable ties were used to temporally hold the bands together while the transmission cover and the operating pedals were installed. Ramp “cams” on the pedal shafts force the shafts outward resulting in the bands being tightened onto the drums when the pedals are depressed. The bottom shaft operates the clutch release yoke. It is coupled to the low speed pedal so the clutch is released when the pedal is depressed part way, providing “neutral”. The reverse pedal can now be depressed to back up, or the brake pedal to stop. 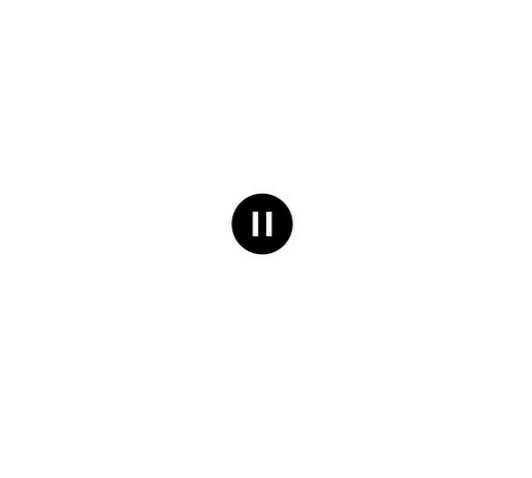 Pressed and held all the way down the car will go forward in low gear. The clutch mechanism is also operated when the hand brake is pulled back. This is the end of the engine overhaul section of the “T” project.